Can you believe Halloween is in 3 days?? My kids have already gotten over a pound of candy each from a parade and church event we attended this weekend, so I know we're going to be up to our eyeballs in candy come Thursday. Not that I'm complaining. I'm actually eating one of the kids' Twix bars right now because I had to make sure it was safe. You know, for the kids.... Unfortunately for them, it seems all the Reeses cups and Twix bars are unsafe. And the Snickers. And pretty much everything that involves chocolate in some way, those were all confiscated. After finishing up Connor's hooded dragon cape, I called it quits on costumes for season. Then, while I was pinning stuff on Pinterest (you can follow us here!) 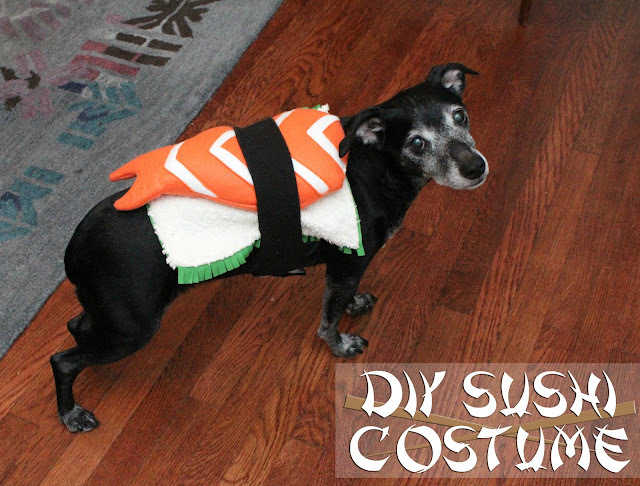 I came across this adorable DIY baby sushi costume. 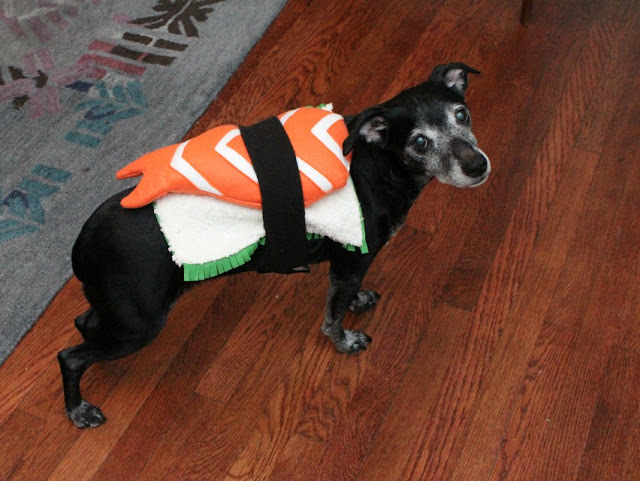 Right then, I decided I needed to make a sushi costume for someone, and who better than Shannon's little black jack russel/black lab mix, Atari? I used some of the leftover orange and green felt from Michael Levine and put this together in a little over an hour. 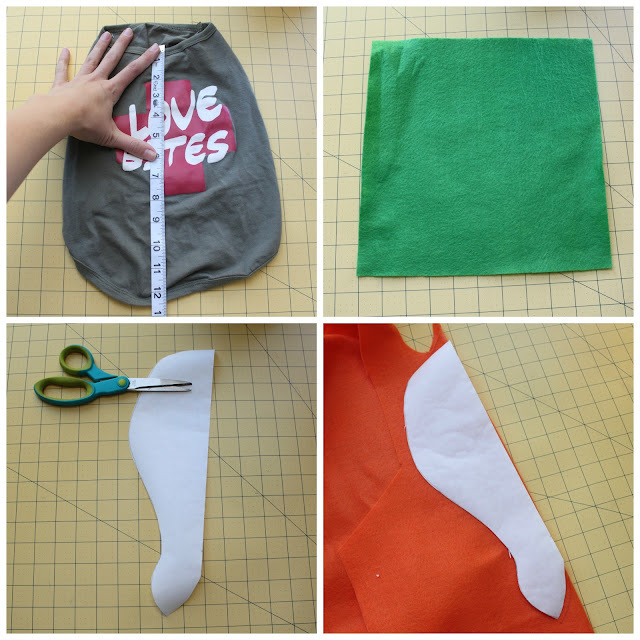 SUPPLIES: 1/4 yard green felt, 1/4 yard orange felt, 1/4 yard white felt, 1/4 yard white cuddle fabric (you can use felt for this too, bu, 1/4 yard black fleece, disappearing ink marker, small amount of polyester toy filling, velcro, sewing machine and supplies. TWO: cut out a green rectangle of fabric in the measurements you wrote down. THREE: next, draw a shrimp template. I just drew half of a shrimp so I could lay the pattern on the fold and get a uniform shape. FOUR: lay your pattern on the fold of your orange felt and trace around. 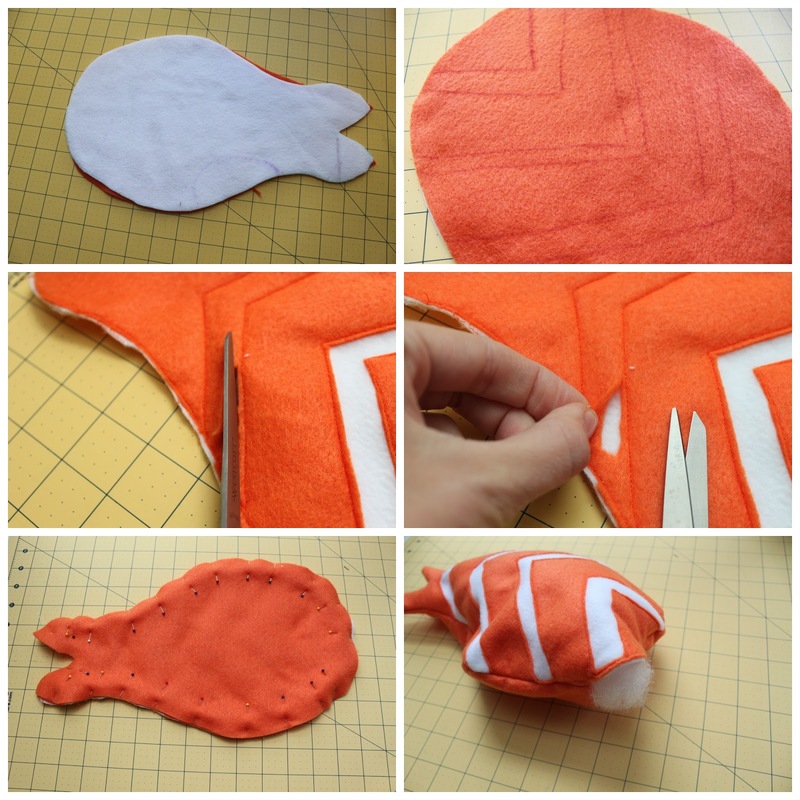 Cut two shrimp from your orange felt and one from your white felt. You should now have 2 orange shrimp, 1 white shrimp, and a green rectangle. ONE: place the white shrimp on top of one of the orange shrimps. Pin, then sew all the way around. TWO: on the orange side of your shrimp, draw V's on your shrimp with disappearing ink marker. Sew on top of the lines you just drew. 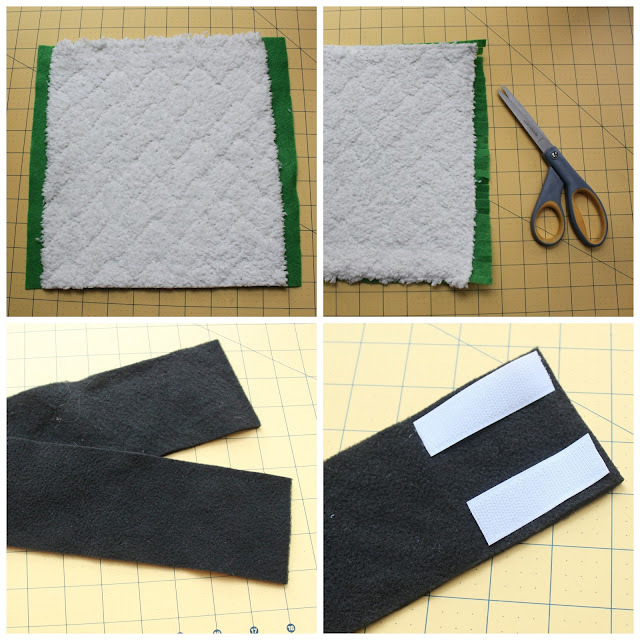 THREE: use a pair of scissors to cut away the top layer only of your V's to reveal the white felt underneath. FOUR: here's what it should look like as you cut. FIVE: with the "V side" facing up, place your other orange shrimp felt piece on top and pin all around. Sew to attach, leaving a 1 inch hole for turning. SIX: turn inside out and stuff with polyester filling. ONE: cut a rectangle from your snuggle fabric as long as your green felt but slightly less wide (I chose snuggle fabric because it has a texture that looks just like rice!) 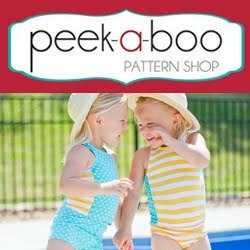 Pin and sew around the edges of your snuggle fabric to join. TWO: use your scissors to cut small slits along the long sides of your green fabric. THREE: cut a long strip of black fleece for the seaweed band that will hold everything together. FOUR: sew the hook portion of your velcro to one end of your band and the loop portion to the other. 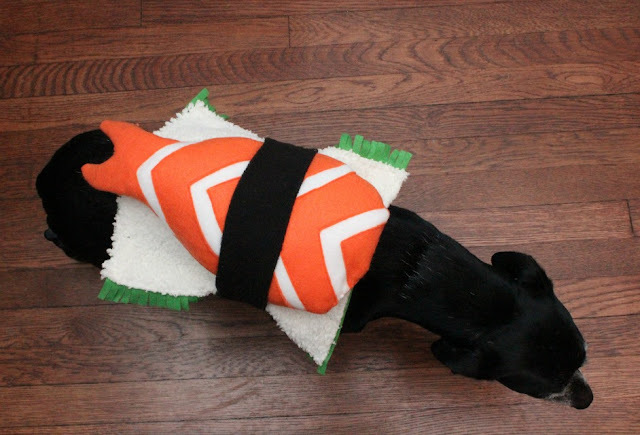 Place your shrimp on top of your snuggle fabric, then wrap your seaweed band around and you're finished! Then all you have to do is attach your sushi roll to your victim, er dog. Atari was clearly thrilled about my decision to make him into a sushi roll ;) I had a lot of fun making a costume for my little fur nephew, even if he wasn't as excited to wear it. he doesn't really seem to be having a problem with that. point for you! plus, it's super cute. Atari doesn't seem to mind about the sushi :) The shrimp is too cuteeee!! This is too funny! Last year we tried dressing up my cat and that didn't go too well! 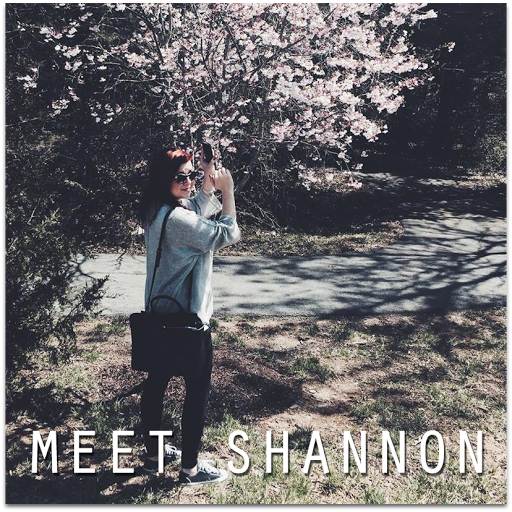 Just wanted to stop by and let you know that I am featuring you today on The Sunday Favourites. Please feel free to stop by and grab a button. 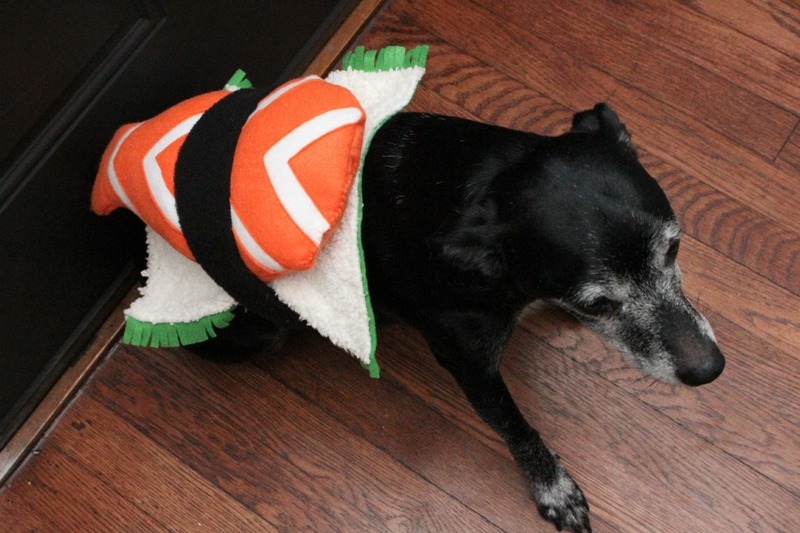 A dog wearing this pet costume may look like a camel.It is so funny!